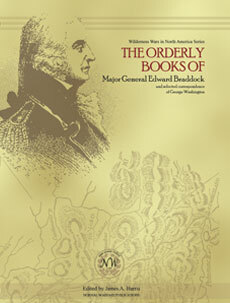 Washington’s copies of General Braddock’s Orderly Books were originally published in 1878 as an appendix to William Lowdermilk’s History of the Cumberland (Maryland). Lowdermilk’s edition, however, contained numerous errors, with entire pages of the manuscript inserted in the wrong locations. The originals, along with most of George Washington’s papers, are held by the Library of Congress and have now been made readily available for viewing on the American Memory pages of their website. This edition reprints Lowdermilk’s original. However, a close comparison has been made to the originals and the appropriate corrections have been made. Part II of this work contains correspondence of George Washington related to the Ohio Expedition of 1755. Included are his accounts of the Battle of Monongahela sent to Lieutenant Governor Robert Dinwiddie, his mother Mary Ball Washington, and his younger brother John Augustine Washington. Washington’s letter book of this time contains memorandums that he inserted later. This edition published those memorandums as Washington originally wrote them. This work contains the British casualty list from the Battle of Monongahela as originally published in Lowdermilk. In addition, as with all Normal Warfare Publications, this work contains an extensive appendix with biographical information on all the major participants mentioned with the work.